With no disrespect to other events, we’ll say that Mustang Week sets the bar. It’s the original Mustang destination event. More than a weekend drag race, more than a one day car show, and more than a weekend open-track event. It’s all those events and lasts a whole week. Michael Johnson, the technical editor over at Muscle Mustangs & Fast Fords put together a great write-up on the 2018 Mustang Week over on the MM&FF website. Jump over and give the article a read for an awesome summary of our 2018 event. Mustang Week 2018 is geared to be one of the biggest Mustang Week events in history! Being one of the largest Mustang events in the country, many fans clear their calendar every year to make it out to this week-long series of events all geared around America’s favorite pony car – the Mustang. 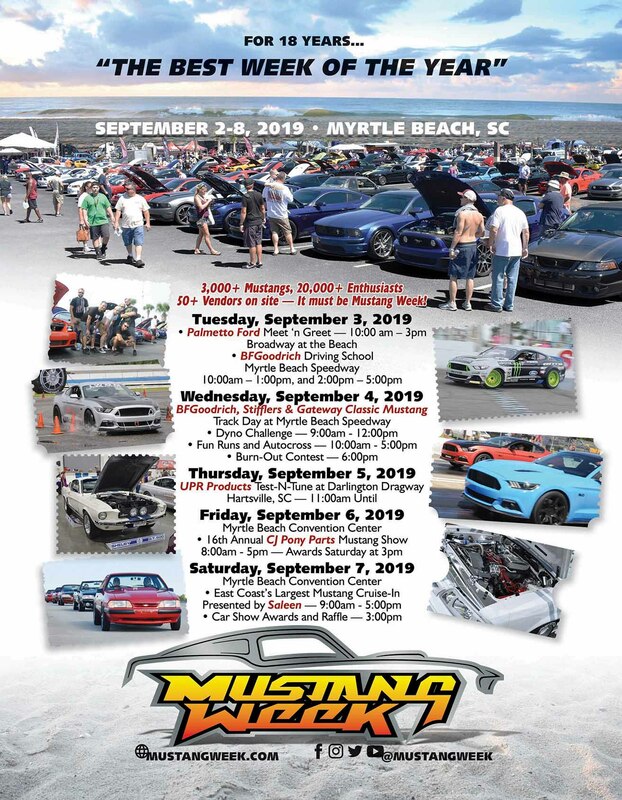 If you haven’t made the trek out to Myrtle Beach, SC for Mustang Week, then be sure to make arrangements for 2018 as this year will be bigger and better than ever! Registration for the Friday Car Show opens on May 12. Registration will be opening May 12 for the 2018 Car Show. If you’re interested in showing your car this year at the Car Show (which is held on Friday of Mustang Week) then be sure to register early. Spots in the show typically sell out fast. Registration is only necessary if you want to enter your car into consideration for judging. If you’re only interested in attending the show as a spectator, there is no need to register. All are welcome to come out and take a look at what this year’s participants bring out. 2018 Event Schedule is now available. Check out our event schedule page to see this year’s schedule for each day of the 2018 Mustang Week. The Mustang Week Staff would like to take this opportunity to thank everyone for all they’ve done to help us make the 16th Annual Mustang Week an overwhelming success. We realize that without volunteers, participants, and the sponsorship there is no way we would be able to continue hosting the largest annual Mustang event in the country. It is always exciting to see participants moving around the different venues, interacting with each other and leading industry sponsors. Mustang Week is different from any other event in the country. Mustang Week is not merely a show. If you attend all the scheduled events, you will see that Mustang Week is an “experience” that can be rivaled by no other weekend show. Where else can you combine a beach vacation with all kinds of driving events and shows? Only at Mustang Week!